A construction incident occurred this afternoon causing a water outage to approximately 250 residences in the Crawford area of Southeast Kelowna. 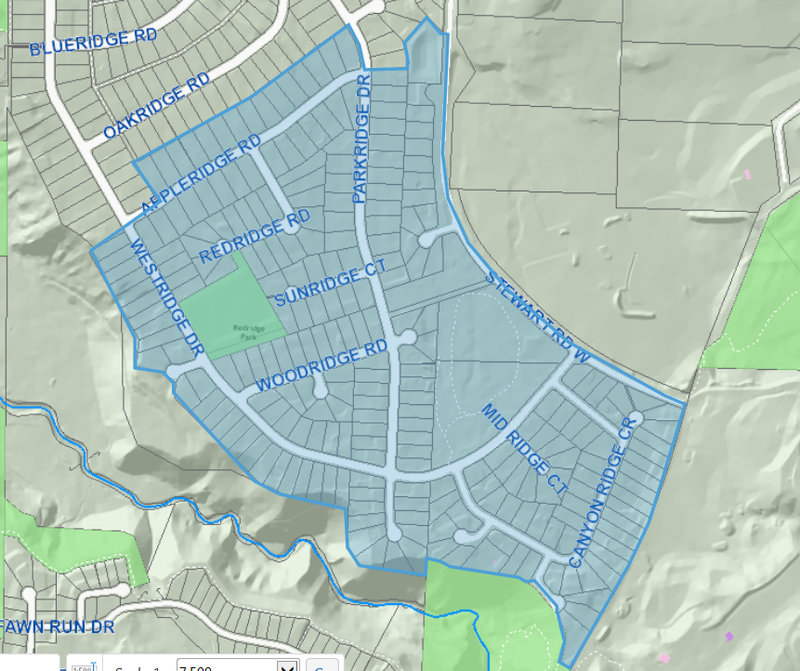 The map below shows the area of homes affected by this outage. While working on Stewart Rd. W, Emil Anderson Construction crews caused a major water line to break. Both Emil Anderson and City crews are on-site working to repair the damage and bring the Upper Crawford reservoir back into service by end of the day. Electronic signs will be posted in the area advising residents the water status. Residents in the impacted area who still have water are recommended to fill their tubs and possibly water jugs or basins to last the next several hours. Those requiring urgent water can visit the Canyon View Ct. cul-de-sac for bottles of clean drinking water at no cost. The City would like to apologize to those impacted by this incident and thank everyone for their understanding and cooperation as every effort is made to return water as quickly as possible. Once water service has been restored, a temporary, precautionary boil water notice will be issued due to potential sediment disturbance in the distribution system. The City will coordinate the water sampling and quality testing to ensure that water quality meets all drinking water guidelines. Until that process is completed, the Boil Water Notice will remain in effect. During a Boil Water Notice, the City advises that any water that has a chance of being ingested should be boiled, whether it’s for beverages, food preparation, coffee machines, brushing teeth, making ice and water for pets. All water should be boiled for one minute, cooled and stored in clean, covered containers in a refrigerator. Residents are reminded to cool water prior to use to avoid burns or scalds. For updates on the Boil Water Notice or to e-Subscribe for updates, visit the City’s Drinking Water page at kelowna.ca/water or call the Water Quality Hotline at 250-469-8475 (recorded message). Water Quality Advisory Used in situations in which the public health threat posed by the water supply system is modest, and actions can be taken to reduce the risks through means other than requiring a Boil Water Notice or Do Not Use Water Notice. Boil Water Notice Used in situations in which the public health threat posed by the water supply system is elevated and the nature of the threat is one that can be effectively addressed through boiling of the water. Do Not Use Notice Used in situations where a significant public health threat exists in relation to the water supply system, and the threat cannot be adequately addressed through a Water Quality Advisory or Boil Water Notice. The Southeast Kelowna Integrated Water Supply project is an $86 million project and is partially funded by a $43.9 million provincial and federal grant. The project will see clean drinking water supplied to Southeast Kelowna and a reliable, resilient source of water for agricultural in the South Mission.